Zombies – they get into everything! Video games, board games, movies and television, there is a never-ending stream of new content featuring the braincraving dead. Once it seemed like they would be a temporary hype, but apparently they are here to stay. Now they’re even getting into our crime procedurals, albeit with an unusual twist. 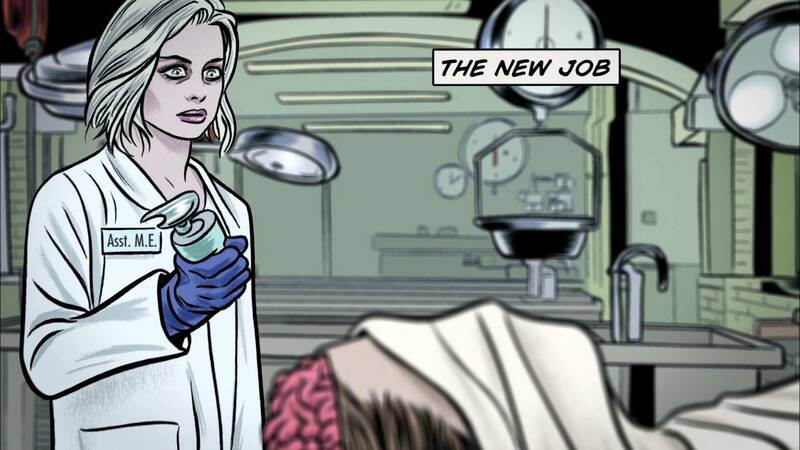 The zombies in iZombie are high-functioning – not actually dead, biologically speaking – and they can be productive members of society, as long as they get their regular dose of brrrraaaaains. They take on some of the characteristics and memories of the people they’ve been snacking on, adding to the dysfunction in their private lives. 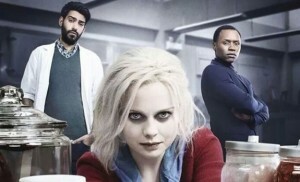 The series revolves around Liv Moore (Rose McIver) who is headed for a promising medical career and has a hunky boyfriend, but has to abandon both when she gets infected and altered. She finds herself a convenient job at a morgue, where she lucks into an understanding boss, Dr. Ravi (Rahul Kohli). They use her special gift to solve murder cases. She chows down on victims’ brains, has cryptic flashbacks plus temporary personality adjustments and hijinks ensue. She also works with police detective Babineaux (Malcolm Goodwin), who thinks she is some kind of spirit medium with unusually pale skin. 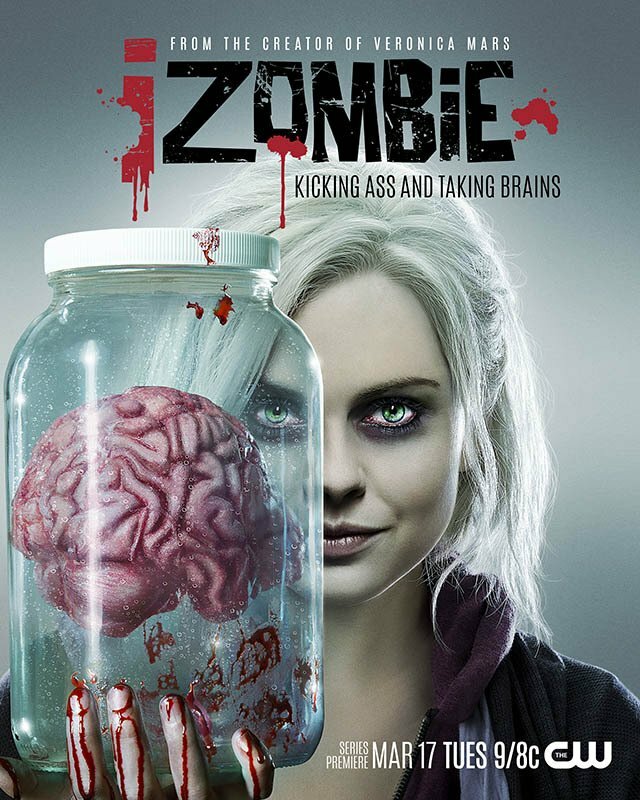 Connecting the cases of the week are the overarching mysteries of where the zombies are coming from, whether they can be cured and how our heroes can stop a mob-like organization of zombies from preying on people. 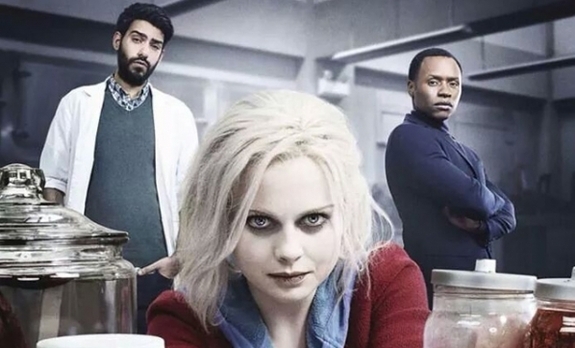 iZombie comes with a pedigree, co-created as it is by Rob Thomas who was the main force behind cult favorite Veronica Mars. There are some similarities; an unusual combination of two cliché genres, snappy dialogue and a feisty lead. But this new series doesn’t achieve lift-off straight away. Some of the funny feels forced and the crime cases on their own aren’t memorable. Towards the end of the first season however, the cast has started to gel, they get more natural at being funny and you discover that a few of the cases dropped seeds for something further down the line. So there is more cohesion than initially seems to be the case. 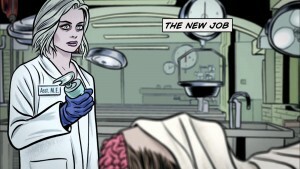 The series is loosely based on a comic with the same name, which explains the stylish opening credits. 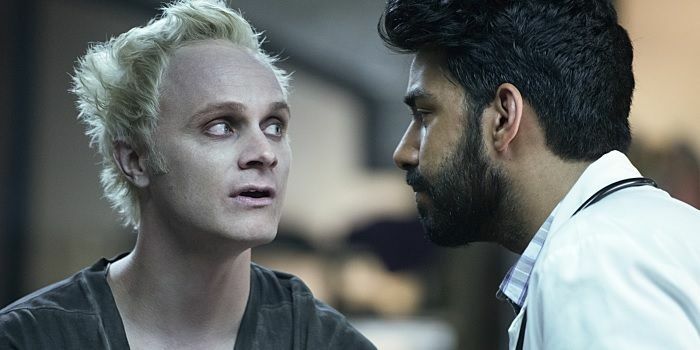 iZombie isn’t an unmitigated success. There are some hard to miss plotholes, a few underdeveloped characters – like Liv’s family and her roommate – and the zombie mythos leaves you with questions. If one scratch makes someone a zombie, how isn’t there a full-on pandemic yet? Why does Liv experience strong shifts in personality – some episodes more than others – while the effect of specific brains on the bad guys is never shown? Suspension of disbelief is required beyond the main concept of zombies. 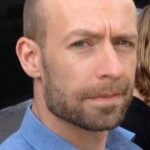 I am not a fan of crime procedurals. They tend to follow an all-too predictable pattern, with familiar beats, where an experienced viewer can spot the twists coming a mile away. Some of the more disposable cases in the show reflect this and it seems like a shame that so much time is spent on them. But I can understand that the writers wanted to lure people in with something familiar and comforting, to sell them on the odd concept that involves a heroine who eats people’s brains. At 13 episodes, this first serving is just about the right amount of entertaining goofiness. Thankfully there will be a second season, as this first one daringly ends on multiple cliffhangers.